The make utility automatically determines which pieces of a large program need to be recompiled, and issues commands to recompile them. 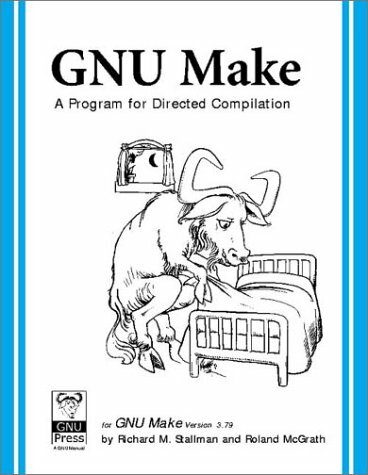 This manual describes GNU make, which was implemented by Richard Stallman and Roland McGrath. Topics include: KDE UI Compliance, Style Reference, The Qt Toolkit, Responsive User Interface, Complex-Function KDE Widgets, Multimedia, DCOP, KParts, Creating Documentation, Packaging Code, CVS and CVSUP, and KDevelop: the IDE for KDE. Read this book to: Find out what Community Edition is all about; Learn how to develop Java EE applications with Community Edition; Understand how Community Edition interacts with databases; Learn everyday Community Edition administration tasks; etc. This book is an expert guide to using GNU autoconf, automake, and libtool effectively. Written for C/C++ or script programmers who write software under Unix/Linux. The text is filled with the nuts-and-bolts details of running these three utilities. Contents: Command Line Arguments; Environment Variables; The Standard I/O Library; Executing Processes as a Stream; Showing system Processes; Creating processes in a program; Processes and Threads; Inter-process Communication; Semaphores; etc.